The Elite Knee-Shin Guards are built for the extreme athlete who needs it all. 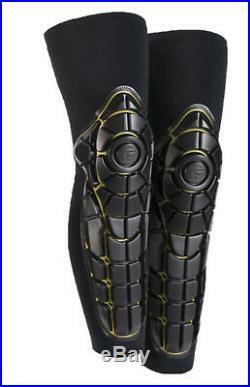 Our Elite Knee-Shin Guards are CE 1621 Level 1 certified, the highest standard for motorcycle armor. Forget about the hassle of separate knee and shin pads, Elite Knee-Shin Guards combine the articulation of our knee pad with integrated shin protection and lateral knee coverage. CE certified for motorcyclist/bicyclist limb protector (CE EN 1621-1:2012). Body-mapped, impact-absorbing RPT pads protect from impact at the knee and shin. Moisture-wicking, UPF 50+ compression fabric keeps wearer dry and comfortable. 2-panel design for second-skin fit. Technical mesh back panel for breathability and moisture-wicking. The item “G-Form Pro-X Knee-Shin Guard, Black/Yellow, X-LARGE” is in sale since Monday, February 25, 2019. This item is in the category “Sporting Goods\Cycling\Helmets & Protective Gear\Protective Pads & Armor”. The seller is “myaccount858″ and is located in San Diego, California. This item can be shipped to United States, Canada, United Kingdom, Denmark, Romania, Slovakia, Bulgaria, Czech republic, Finland, Hungary, Latvia, Lithuania, Malta, Estonia, Australia, Greece, Portugal, Cyprus, Slovenia, Japan, Sweden, South Korea, Indonesia, Taiwan, South africa, Thailand, Belgium, France, Hong Kong, Ireland, Netherlands, Poland, Spain, Italy, Germany, Austria, Bahamas, Israel, Mexico, New Zealand, Philippines, Singapore, Switzerland, Norway, Saudi arabia, Ukraine, United arab emirates, Qatar, Kuwait, Bahrain, Croatia, Malaysia, Brazil, Chile, Colombia, Costa rica, Dominican republic, Panama, Trinidad and tobago, Guatemala, El salvador, Honduras, Jamaica, Viet nam, Uruguay, China, Grenada, Barbados, Brunei darussalam, Bolivia, Ecuador, Egypt, Iceland, Paraguay.